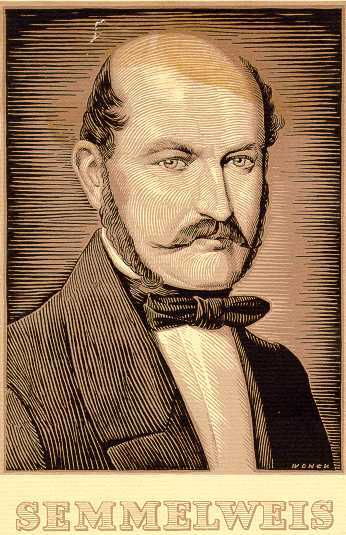 It must be hoped that posterity will view today's medical wisdom more kindly than our perspective on the 19th Viennese medical profession that destroyed Hungarian obstetrician Ignaz Semmelweis. Semmelweis demonstrated (1861) that puerperal fever ("childbed fever") was both infectious and contagious - and largely preventable by scrupulous hand-washing. A deeper explanation of its effectiveness was initially obscure. His germ-ridden colleagues did not take kindly to the suggestion they were responsible for causing the death of their patients by failing to sterilize their hands between patient examinations. Semmelweis and Holmes were not the first investigators to recognise the contagious nature of puerperal fever. In Treatise on the Epidemic of Puerperal Fever (1795), ex-naval surgeon and Aberdonian accoucheur Dr Alexander Gordon (1752-99) warned that the disease was transmitted from one case to another by midwives and doctors: "It is a disagreeable declaration for me to mention, that I myself was the means of carrying the infection to a great number of women". To contain the spread of infection, Gordon recommended that the infected patient’s clothing and bed linen should be burned. Doctors and midwives were enjoined carefully to change clothes, wash themselves and fumigate their own clothing too. Unfortunately, Gordon was ignored. Like Holmes, Semmelweis was left to make the same painful discovery independently. Semmelweis was ultimately vindicated, but only after he had been driven to insanity and suicide, and thousands more mothers had lost their lives to infection.